Lt Ummer Fayaz, who was a newly commissioned officer in the Indian Army, was abducted by terrorists on 9th May while he was attending a cousin’s wedding in South Kashmir’s Shopian district and his bullet ridden body was found the next day. He was unarmed at the time of the abduction. His cold blooded murder shocked the nation and it has now prompted BJP Delhi’s spokesperson Tajinder Bagga to put in a request so as to etch him (Lt Fayaz) into public memory. 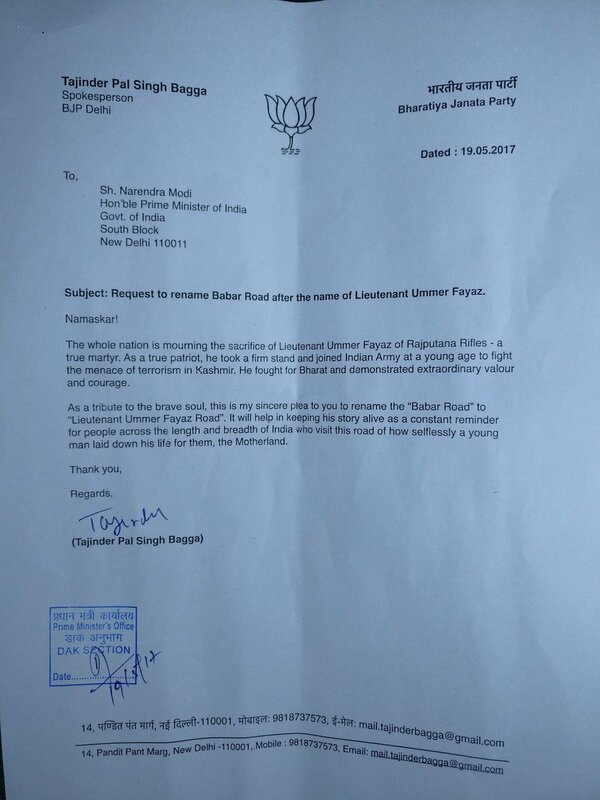 As announced by him on Twitter, he has written to Prime Minister Narendra Modi, New Delhi’s MP Meenakshi Lekhi and Naresh Kumar the Chairman of New Delhi Municipal Corporation, requesting them to rename ”Babar Road” in New Delhi as ”Lt Ummer Fayaz road”. In the letters dated 19th May, Bagga pointed out how the entire nation was mourning the death of Lt Fayaz. The Delhi BJP spokesperson further stated how, as a true patriot Lt Fayaz took a firm decision to join the army in order to fight the menace of terrorism demonstrating extraordinary valor and courage. Bagga justified his request by claiming that renaming the road would keep Lt Fayaz’s story alive and would serve as a reminder to all countrymen about how a young man selflessly sacrificed his life for the nation. Renaming of roads is not new. NDMC had renamed Aurangzeb Road, Race Course Road and Dalhousie Road as APJ Abdul Kalam Azad Road, Lok Kalyan Marg and Dara Shikoh road respectively in 2015, 2016 and 2017. According to reports, a senior official of the NDMC has placed it on record that a decision would be taken as per the given procedure once the letter is received.